I saw this technique online a while ago and finally got around to making a few little notebooks. I'm not gonnnnna lie... explaining this technique is really tedious and confusing but once you understand it, it makes sense. It's really better if you go through this tutorial while actually making the notebook. You'll need some copy paper (I used 8-10 pieces in these little journals), a piece of scrapbook paper and a piece of cardstock. You will also need a glue stick, a needle and embroidery thread. Cut all of the papers into the same size. Mine were 5 inches x 8 inches. Fold all the papers in half, keeping all the copy paper together. Glue the cardstock on the inside of the scrapbook paper to create the cover. I used a glue stick. Punch 5 holes down the folded side of the copy paper and poke holes in the cover in the same places. Take the needle and thread and thread it through the second hole from the left side. Make sure you leave a small amount of string to tie later. Loop the needle around and back through the same hole. Turn the book around put the needle through the hole third from the right. Then loop it through again. Turn the book around again and put the needle through the second hole from the right. Then loop the needle around and right back through the same hole. Flip the book around and put the needle through the last hole on the left. Wrap the thread around the end of the notebook. And put the needle through the same hole again. Turn the book around and put the needle through the second hole from the right. Turn the notebook around and put the needle through the middle hole. It should look like this. You are basically going back through every hole with the needle until you get to the last hole. Once you put the needle through the last hole, don't forget to loop the needle back through the same hole. Then repeat the same thing you did on the other end of the notebook. And tie a knot with the two ends. Finished! Now you can decorate as you wish. I grabbed some twigs from outside. And hot glued them on the front of the notebook. 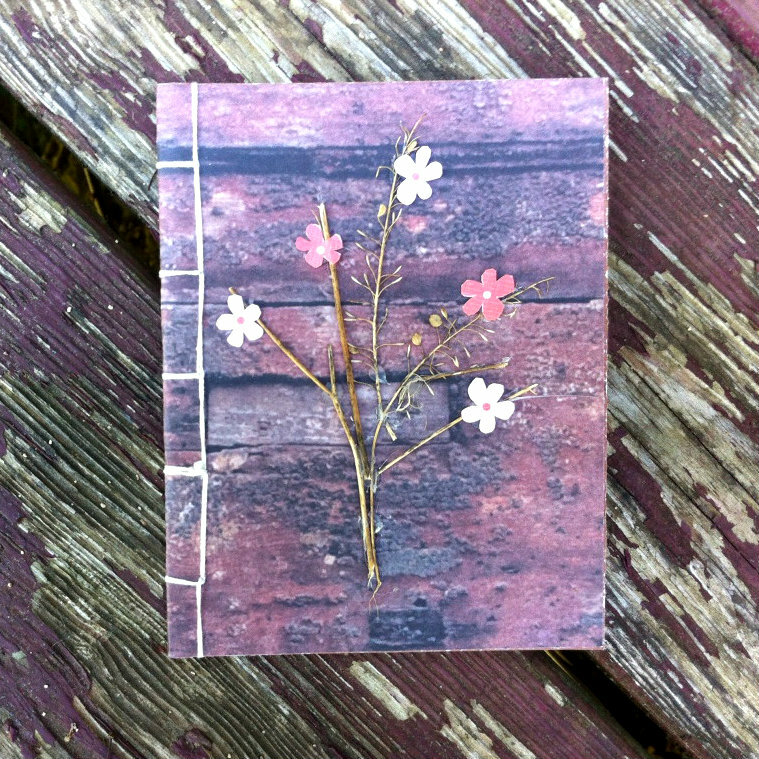 I cut out some flowers from a piece of scrapbook paper. And then glued them on the front as well. Done! That looks so good! Great diy! I'm kinda obsessed with notebooks. These are great! Fab diy. What a fun idea, LOVE the tree design! Wonderful, thanks for the tutorial!